Simple and sweet single blossoms and bows, for adding just a little touch of sweetness to any outfit. Your girls need this! A real baseball, made into a bow!! Measures approximately 3.5" across. Shown with a white pearl center, but you can choose to have a ribbon center. PLEASE LEAVE NOTE AT CHECKOUT FOR PEARL COLOR, otherwise you will receive WHITE. Most colors are available, but please feel free to email me to confirm your color choice is available. Shown on an alligator clip, but will also work on elastic. These do NOT work on hard headbands or French Barrettes. Your girls need this! A real softball, made into a bow!! Measures approximately 4.5" across. Shown with a red pearl center, but you can choose to have a ribbon center. PLEASE LEAVE NOTE AT CHECKOUT FOR PEARL COLOR, otherwise you will receive RED. Most colors are available, but please feel free to email me to confirm your color choice is available. Shown on an alligator clip, but will also work on elastic. These do NOT work on hard headbands or French barrettes. If you have a little Trolls lover, then you NEED this Poppy Bow! Shown on turquoise glitter elastic, but works on clips or hard headbands as well. The sweetest little Rudolph the Red Nosed Reindeer bow you ever have seen! Hand sewn khaki colored bow with gold glitter ears, hand drawn eyes, brown felt antlers, and a sparkly red nose set on a red sequin center. Shown on an alligator clip. 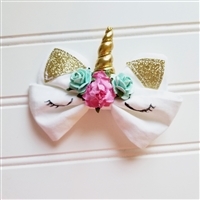 You can see a photo of Gracie wearing The Unicorn Bow in the second photo, which is the same shape and size as Rudolph. 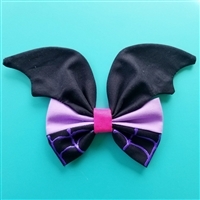 Elastic and hard headbands are both an option, however, please note that the bow will run the length of the elastic/headband, so the antlers will point toward the back of the head. If choosing a hard headband, please leave a note at checkout if you prefer to have the bow centered on the top or offset as a normal bow is worn.